Perhaps this is how Mr. Trump would review mockups of his nonsensical border "wall". Realized here as a giant picket fence (from a time when America was GREAT), gold leafed per Mr. Trump’s decorating taste, 30’ tall and fatally electrified to keep out all the dangerous immigrants. See our Home Page for the full story. Border wall mockup - Mar-a-Lago golf course. "Embracing the irrational can lead to desparately dangerous thinking. Nature can be over idealized, and a reinvented past can be twisted out of recognition to serve a dark purpose. Nationalism, if excessive, can lead to xenophobia and war. And emotion can chase reason out into the wilderness." 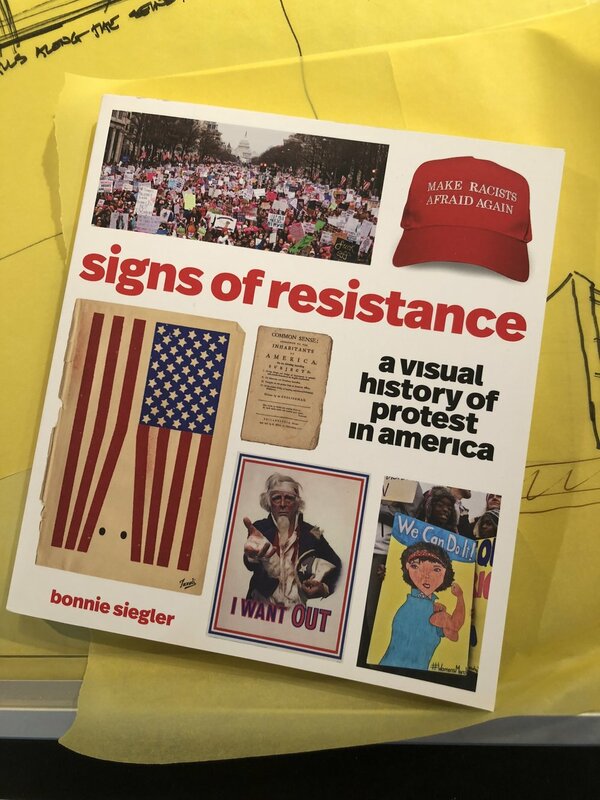 Our design work was recently published in "Signs of Resistance". We love the bold tag line... "Extreme anger can kick up the creativity to a whole new level". Thanks Bonnie Siegler for including us in you book. EVERYONE must speak out against the egregious action's of Mr. Trump's administration and the culpable members of the U.S. Legislature. "This temporary architecture piece has fabulous spirit and makes a profound political statement." The executive branch unfortunately continues to proliferate our country with completely absurd actions. One cannot be an objective citizen of this great country and ignore the differences between basic rights and wrongs. We were taught these as children. These should not be partisan issues. 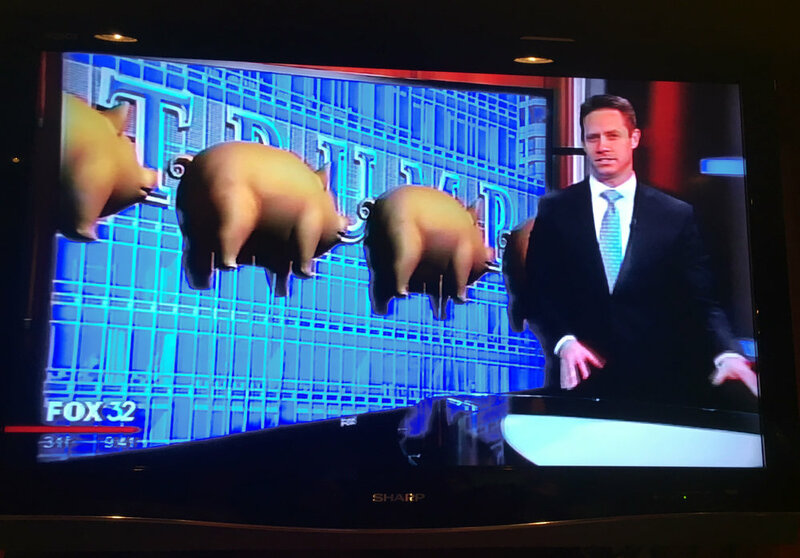 The past months of this presidency have been a figurative descent through the chapters of Animal Farm. The moral relevancy of our project, sadly, becomes more substantiated each day. As the recklessness continues, our team will persist in our efforts to deploy this art installation. We are reassessing deployment strategies in an effort to gain municipal approval in 2018. Please check back for the latest updates! After many months of logistical strategizing, technical design and efforts toward municipal approval, we are at a tactical point where we cannot proceed forward with our installation in Chicago in 2017. The balloons (to be fabricated inn England) require six weeks to fabricate and then another two weeks to deliver. This alone pushes the potential float date past September and beyond what we deem as a practical weather window. 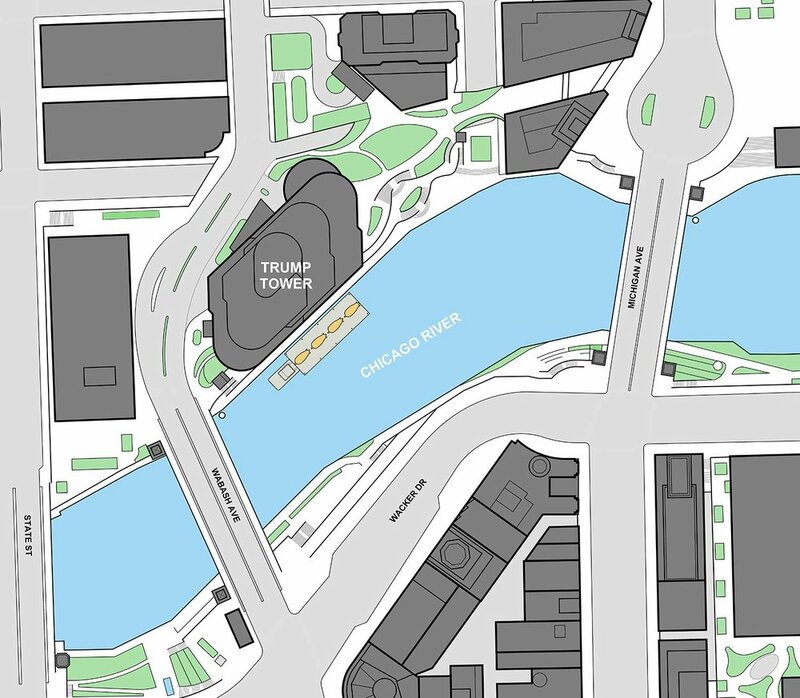 In addition to the timeline logistics, Chicago's transportation department would need to sign off on a permit to dock the construction barge in the designated location (in front of the Trump International Hotel and Tower). They are declining to do so. Among the concerns cited by the department are the potential for hindrance of heavy summer commercial and recreational traffic on the river as well as the issue of setting precedent (of allowing docking in the area). New World Design is continuing to pursue a 2018 exhibit in Chicago as well as assess opportunities in other cities. This website will remain operational (accepting donations and offering merchandise) as long as the project maintains forward momentum. We believe that our design is perfectly suited to its time and place in the world. Each day's news validates our belief in this. Since early this year NWD has been communicating with city officials seeking permission to deploy our art installation. As this is a unique installation there is no template to look at (for us or the city) in getting to approval. Various departments have been involved in these communications; office of special events, the police marine unit, Chicago Department of Transportation, the Coast Guard, the municipal legal department, the Department of Buildings and the alderman's office. As with any municipality these folks handle many tasks, so the going has been slow. We will know whether our project will move forward in 2017 within the next few days. Please stay tuned. Technically sorting out how to successfully float four massive helium inflatables was a unique challenge for the design team. Thanks to our creative, Chicago based structural engineers, Goodfriend Magruder Structure, the balloons will be safe and stable in light to moderate wind conditions. The upward lift capacity of the balloons was determined by calculating the lift value of the helium volume in combination with the weight of the balloons and tethers. To stabilize the lift value, we will utilize broadly spaced anchoring points on the barge deck. The triangulated tethers will loop through welded deck anchors allowing for rigging. To add linear stability, the inflatables will be tethered nose-to-tail with calculated cord lengths. Using math, science, and a rational process can yield amazing things. We recently had the opportunity to talk with Illinois Public Radio. Since we had the benefit of a little longer air time, it gave a a great opportunity to tell the FPOP story more comprehensively. Our graphic designer has created a new "flag" for the project. Taking cues from the four floating pigs (in gold) and manifesting them in a minimalist fashion seemed to articulate the idea in a concise manner. 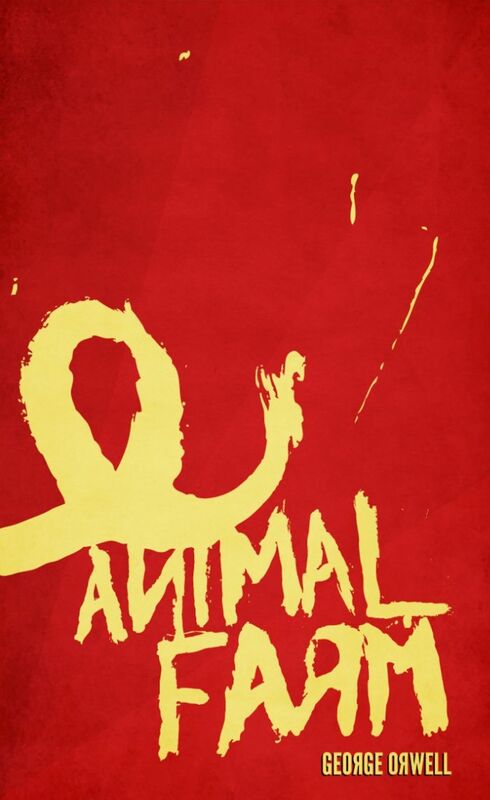 As with the T-shirt design, we use the font from the first edition printing of Animal Farm. Gaining municipal approval in a major city to deploy an art event of this scale is no small feet. Needless to say, it is a unique project that leaves committee members scratching their heads. We have been patiently working our way through the sequence of the necessary meetings. In general, all is positive, but there are still a variety of issues to resolve before approval can be gained. As soon as we can cross a certain threshold, we will share the story of the process. Until then, we don't feel it is prudent to step on the toes of those that are assisting us through the challenges. No worries on small delays because, as our leadership has shown, the folly's theme will continue to be relevant. "Animal Farm was the first book in which I tried, with full consciousness of what I was doing, to fuse political purpose and artistic purpose into one whole." George Orwell, Why I Write, summer 1946. We never set out to be balloon launch experts. New World Design began this effort as a piece of post election therapy for their office. A disillusioned creative office did what designers do best, they designed. 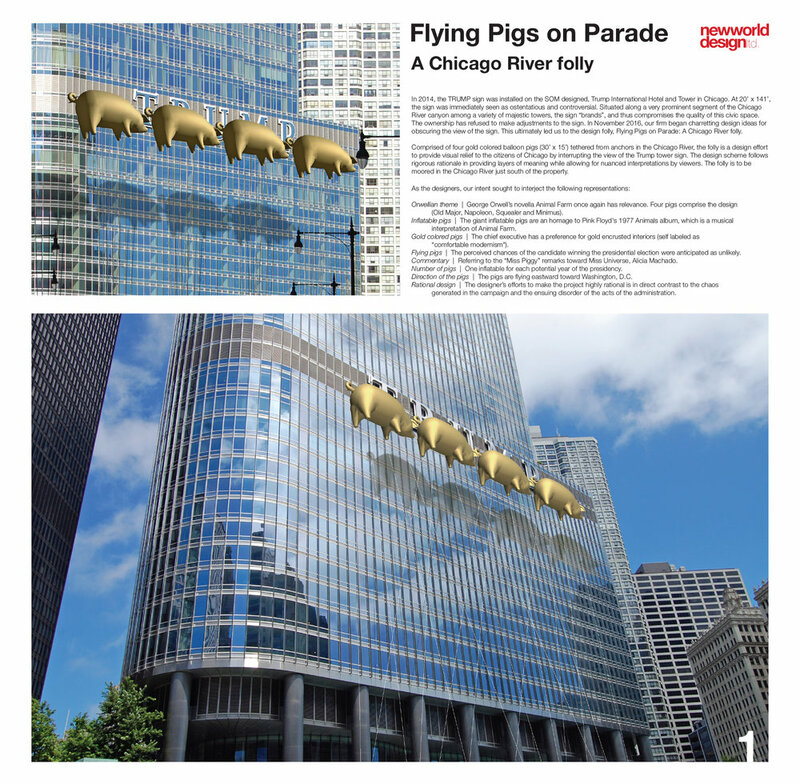 In this case they responded to the nagging issue of an ostentatious sign that was installed in 2014, the Trump Tower Chicago sign. Since the 20' tall T R U M P letters were affixed to the building, they have been chided by the design community for their bad taste. Any name at this scale, be it SMITH or JONES or whatever, would have been unacceptable. It "brands" a highly visible area of Chicago's urban fabric in manner completely unsuited to our city. Then Mr. Trump ran for, and is elected, president via the most tasteless and erratic political display in American history. Now here we are on Inauguration Day. This is not a "brand" that speaks for the vast majority of Chicagoans. Over the next few months our intent is to tell the story of this process and experience through this website. We are a small operation that is driven by our passion for fairness in humanity. This is our method for fighting back and giving our community of rational minds a bigger voice. We recently received a "proof" batch of t-shirts. We're intending to offer the shirts for sale with proceeds going to the project implementation effort. 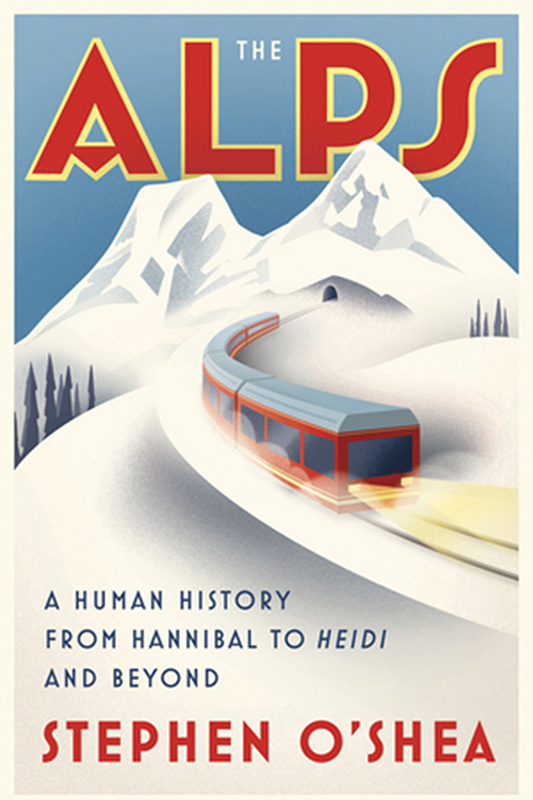 The front graphic is distilled from the original project renderings. The back of the shirt offers a simple and clear message. We used the same font as on the cover of the first edition of George Orwell's Animal Farm (Franklin Gothic). The shirts are also American made and printed (contrary to Mr. Trumps products). They will be shipped in environmentally friendly packaging.